As one of the founding partners, Babji Vundavilli has been part of Sandhata since its formation in 2005. He started as Sandhata’s CFO before moving into his current role as CAO. Babji holds an MBA from Anglia Ruskin University and masters from Andhra University in finance and banking. He has since been working in IT for over 19 years, where he has a multitude of experience across a broad range of industries, in particular, the financial services, telecoms and airline industries. 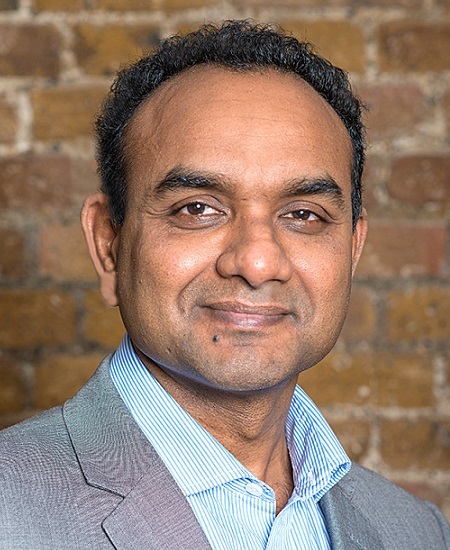 Throughout his professional career, Babji has led numerous significant change programmes in the technology domain, delivering IT transformation programmes for banking and telecoms clients. He has driven a wide range of initiatives, blending commercial, organisational, process and technology change, to solve key business problems. Babji brings this experience with him to Sandhata along with a passion for the future success of the company and going the extra mile to support Sandhata’s clients. Aside from work, Babji is an executive member of Manavata, a charitable organisation to which Sandhata is a partner, supporter and fundraiser for. Manavata runs social initiatives in health, education, environment and humanitarian aid worldwide. Babji is also a keen runner, participating in parkrun each week, as well as painting, enjoying cricket and spending time with his children.